Nehemiah 2:18 "Then I told them of the hand of my God which was good upon me; as also the king's words that he had spoken unto me. And they said, Let us rise up and build. So they strengthened their hands for this good work." 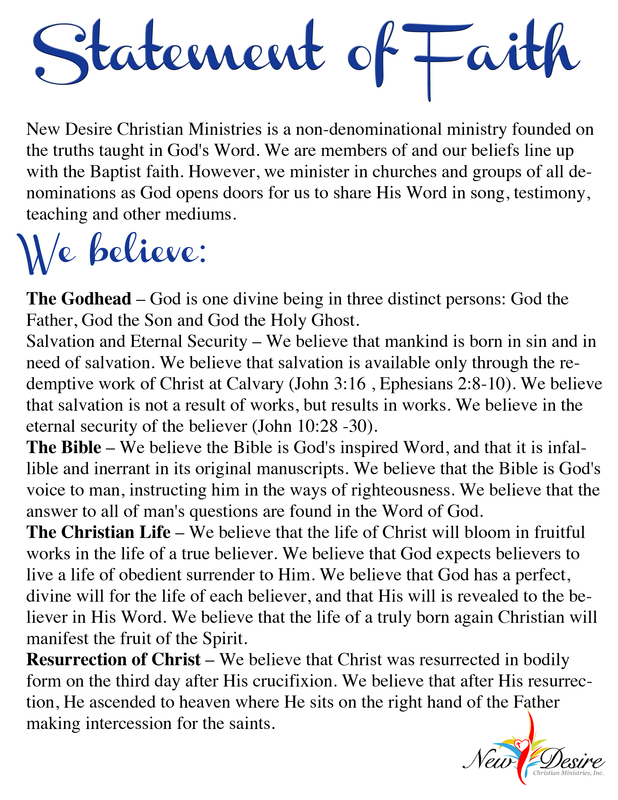 New Desire Christian Ministries has been strongly led by the Lord to begin a new phase of ministry titled "Wall Builders." This ministry will strive to communicate the Gospel not only in churches, concert venues, private retreats, youth retreats/rallies but also in the streets, homeless shelters, prisons, jails, etc. We will endeavor to do this by providing the spiritual as well as the physical needs of people. More doors are opening for New Desire Christian Ministries outside the four walls of the local assembly. For those of you that know us, you know that our heart has always been to not just spread the Gospel but to communicate it. As a pastor friend of ours says, "Each one; Reach one." This is our goal through Wall Builders. As we go in to jails, prisons, shelters, rehab centers, etc, we have the opportunity to provide people with Bibles, clothing, Spiritual literature, Biblical principles/counseling at no charge to them. We do this through others partnering with us through the "Wall Builders Ministry." You can become a Wall Builder with New Desire by donating only $5/month or more if you so desire or feel led. We have many who are already supporting this aspect of our ministry on a monthly auto-pay basis. Wall Builders will be offering to all of their partners a bi-monthly newsletter. 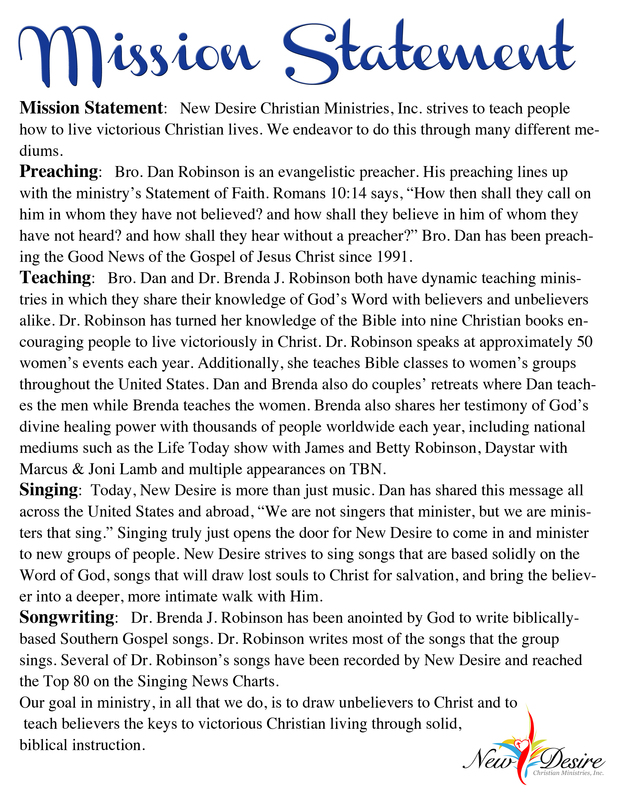 This newsletter will be a publication of New Desire Christian Ministries. It will be focused on building each individual Spiritually and training them how to have a closer intimate relationship with Christ. This new endeavor will also give New Desire's website a new "face lift." Our newly designed website will be a place you will want to visit daily. It will consist of daily devotionals & Bible teachings not only from Dan and Brenda but also Labron and Brooke. We will have many new technological facets to offer. You will be able to download ringtones of our music, podcasts of speeches and messages from members of New Desire, and many other exciting avenues that will allow all ages to grow in the Lord. We even have a place for the youth to call home. We ask that you pray about giving to this ministry, whether through your donations, prayers or volunteer efforts. 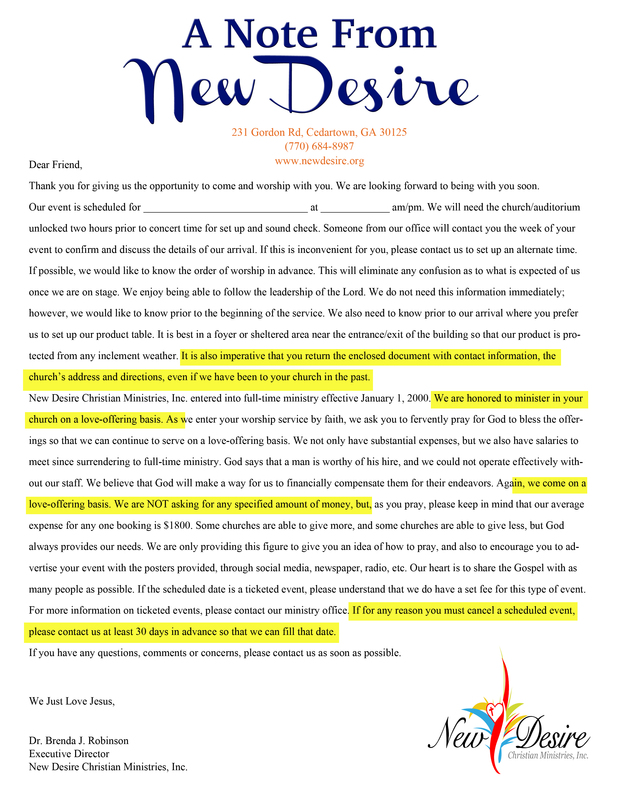 Through partnering with us, you become direct and indirect soul winners with New Desire Christian Ministries. Once again, we are a non-profit organization, and your donations may be tax deductible. Consult your tax professional for more information. We thank you for your support of and prayers for this endeavor. Yes, I want to be a Wallbuilder! or enter your initial amount below. 1. International MissionsAs partners, we spread the Good News of Jesus Christ to the utter most parts of the world. 2. Around the ClockYour partnership carries the Gospel to all ages, races, nations, and creeds, through radio, TV, internet, and other means, 24 hours a day, 7 days per week. 3. Edifying and Building the ChurchNew Desire Christian Ministries is able to go into the local assembly with sound Biblical teaching, that will equip, encourage, and strengthen the body of believers for the work of the church. 4.Reaching the UnchurchedYour support allows New Desire Christian Ministries to carry the word of God into homeless shelters, the streets, prison cells, broken homes, rehab centers, and third world countries, leading the lost to Salvation. and Restoring the LostTogether, we can provide the truth of God’s Word to the lost and the saved through bible studies, church services, youth rallies, women’s conferences, revivals, printed material, and music. 6. FaithfulnessThrough your faithfulness to provide financial support, this ministry is able to lead others to faithfulness in Christ, thereby making you a direct and indirect soul-winner. 7. Discipleship TrainingYour support enables us to mentor and counsel thousands of individuals who hunger and thirst for righteousness, leading them to salvation and into a personal, intimate relationship with Christ. 8. A New DesireThrough your giving, we are able to invest time with individuals whose lives have been shattered and filled with hopelessness, but who long for a better way and a new desire for Jesus Christ.